Retirees who are interested in sharing the knowledge and skills they’ve acquired or who want to try something totally new will find an abundance of volunteer opportunities available. 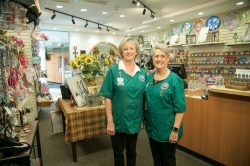 Through our numerous non-profit agencies, medical and educational facilities, historic sites, cultural and civic organizations, and religious institutions, retirees can choose to work with and for just about any age group or cause. As an added bonus, volunteering enables retirees to meet other residents with similar interests and become connected within the community. If you’d like to become one of the many volunteers helping to make Nacogdoches an even better place to live, call the Chamber of Commerce staff at 936/560-5533 to learn how to contact the group or groups that match your particular interests. Volunteer to do great things — build houses with Habitat for Humanity, learn about Nacogdoches history and give group tours at the Nacogdoches CVB, or join the Nacogdoches Memorial Health Auxiliary to assist patients and their families!